(From Sigma lens literature) Using Sigma's original OS (Optical Stabilizer) function, two types of sensors inside the lens detect vertical and horizontal movement of the camera. Two types of camera-shake compensation modes handle all types of shooting conditions. In Mode 1, the system detects and compensates for vertical and horizontal movement of the camera; ideal for still-image photography. And in Mode 2, the system detects and compensates for vertical movement of the camera; ideal for motor sports and other situations where panning may be desired. This lens has two SLD (Special Low Dispersion) glass elements in the front lens group and one in the rear lens group for correction of chromatic aberration throughout the entire zoom range. The rear focus eliminates the need for the front of the lens to rotate, thus allowing the use of circular polarizing filter. A zoom lock switch is built in to prevent the lens from extending due to its own weight, and the lens is easier to use. It is also possible to use this lens with Sigma 1.4x EX and 2x EX APO Tele-Converter to make ultra tele-zoom. With the optional APO tele-converter 1.4x EX, it works as a manual focus tele-zoom lens from 112mm to 560mm f/6.3-8. With APO tele-converter 2.0x EX, it works as a manual focus tele-zoom lens from 160mm to 800mm f/9-11. sharp and contrasty, optical stabilization, cheap for what you get, great build quality. no HSM so slower focus than competition, weight. I used this lens for some time while trying to decide which wildlife lens to get for my Canon 10D. I was deciding between this and the 100-400 L IS. hen you want not to be static (so tripod may not be very usable and the ability to zoom may help being more reactive). ditions (the downside of this point is the rather important weight, even compared to lenses like the 100-400, which do have a much lower weight, for roughly the same build quality). The main disadvantage I found it to have (and the reason why I returned it and kept the Canon) is the Autofocus. This lens has no internal HSM motor and focuses slower than the 100-400 and than my Sigma 70-200 EX... It is not extremely slow but for flying birds, it will be difficult to get it to track. For static subjects, it would definetely be fine, but for fast action, you may probably want for more... But at the price, it is difficult to complain! Highly recommended despite the lack of HSM! 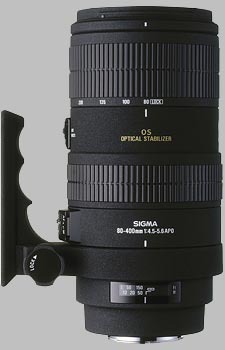 This is another great lens by Sigma! None I know of yet, it's heavy, but I expected that. I bought the new DG version of this lens just over a week ago, hoping that the image stabilizer would help me get relatively sharp shots while hand holding. Due to age I am not as steady as I once was, plus because we now all can see our images in great detail on computer screens I am now much more aware of camera shake than I used to be. Well it's fair to say this lens blew me away, the images from my first batch of test shots were way beyond my highest expectations. I am using it on a Canon 20D which makes the lens become a 128-640 in relative terms due to the sensor size. Rather than go into details here I will list the link to the message on the sister forum of this where I have uploaded several as shot full resolution images, which you can download & evaluate yourself, plus another regular there has posted some similar shots using his Canon 100-400 L lens for an accurate comparison. I am still trying to learn how to hold it correctly, this is one of the bigest & heaviest lenses I have ever owned by a big factor. (recently also bought the Sigma 50-500 which is similar in size & weight). Hope this is helpful to anyone considering this lens.